My nephew found out I had never read 1984, and gave it to me for my birthday. I started to read it just this week. I had it with me at Wednesday night's UFT Delegate Assembly, and finished it the next morning. I am simply gobstruck by the parallels in our union structure and Orwell's dystopian vision. That resonates on many levels. First of all, look at the masses of us who don't even vote in union elections, over 80% in fact. Most of us have no voice in the union at all, and don't even think it's worth the time to write an X on a ballot. Those of us who do know how rigged the winner-take-all election is, how so many positions are "at large," and how high school teachers, in particular, have been prevented from selecting their own VP, simply because they once dared to choose one that wasn't Unity. Then there is the rewriting of history, which takes place on a regular basis. Just the other night at the DA, Mulgrew was saying the new Cuomo APPR was better than the current system because "student achievement," AKA junk science, can trump principal judgment. Oddly, I heard the same thing at a citywide HS CL meeting, from a DR who was indignant that I dared question VAM. Conversely, Mulgrew says principal judgment can trump test scores, but forgets to mention that outside observers will now be a factor. The rewriting of history is regular and predictable at the DA. I remember the UFT transfer plan, which got me out of a school in which I was punished for not throwing kids out of class. Mulgrew says Open Market is better because more transfers occur, but clearly doesn't consult with ATR teachers, for whom he's procured second tier due process and the right to be fired for missing two interviews. Year one of APPR, the one where John King designed it for us, we won a great victory by getting all 22 components of Danielson. Bloomberg wanted only 7 but we held firm. Year two we won another great victory by winning 8. Whatever they do is a victory, and every year the new system is wonderful. Even next year's atrocity is a great victory. Of course, Mulgrew is not a teacher and has not been one for years. He doesn't know the anxiety that faces those of us who actually do the work. He can stand there and say only this many people got poor ratings, but he doesn't actually have to face the people looking at job loss. We are the proles, the proletariat. We are not members of the party, and have no access to the perks and privileges they have. At the lowest level, it means they ostensibly represent us in NYSUT and AFT. They do this, of course, by voting precisely as told and sign an oath to do exactly that. Anyone violating party rules is expelled, and has been ever since its inception, when Shanker bounced people for opposing the Vietnam War. Some in the party get extra privileges, like jobs doing this or that, and then there is the mysterious Inner Party, where the actual decisions are made. Who actually makes the decisions in the party? Who knows? Mulgrew? Has he got the imagination to do that? And if he's so smart, why is he constantly telling the DA how smart his decisions are? Is it Weingarten? Honestly I have no idea. I just know that most of us have no voice whatsoever, and that's precisely why there is so much cynicism and apathy in the ranks. There's no actual torture, but all the NYSUT delegates had sandwiches and things from their NYSUT meeting taking place at some other part of the building not open to us unconnected chapter leaders. I suppose that might be an incentive for some to join the Party. I once had a Unity chapter leader to whom sandwiches were very important. Me, I just got creeped out and ran to Chipotle's down the block. 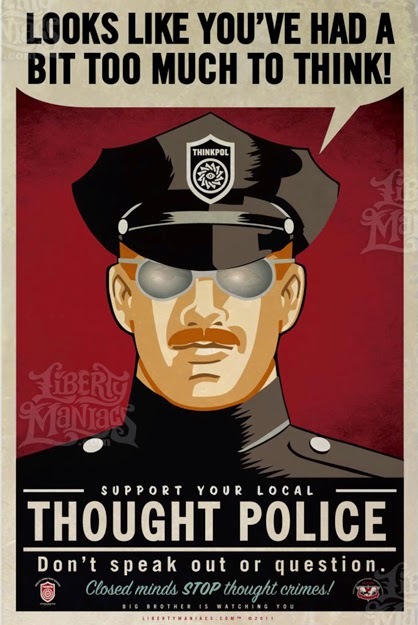 They don't have actual Thought Police watching us proles who haven't signed the oath, and their arguments can't weather a whole lot of public scrutiny. Still, they've got their 80% of disconnected, disinterested teachers and their power looks assured no matter how we suffer at the bottom. Related: Mr. A. Talk also finds the antics of Unity Orwellian.